OK, it’s official. It’s love. You know I had a rocky start. My friends assured me I would like this guy, but when I met him I was like, “What? But he’s so loud. And what’s with the endless joking?”. It took me a while to see through his frivolity and realize that he wasn’t actually shallow or stupid, far from it. Having knocking myself out with the doom and gloom of Sandglass, I’ve decided to go for lighter fare in my back-log watching. I’ve roused out Evasive Inquiry Agency from 2007 (alternatively called “Mixed-Up Investigative Agency“), a show probably most famous for starring Lee Min Ki, but interesting to me because it was written by Park Yeon Seon, who also wrote the sublime Alone in Love (see my review in Thundie’s Prattle) as well as the less successful but nonetheless above-average Wild Romance. The show hasn’t bothered to package itself attractively. There is nothing very shiny about the first episode. It presents to us ordinary people living ordinary lives in a very ordinary neighbourhood and dealing with the very ordinary matter of finding money. But hopefully the show’s very ordinariness can be turned into relatability that can foster interest. By the second episode the show’s four main characters are embarking on some quest, which will hopefully move things along. 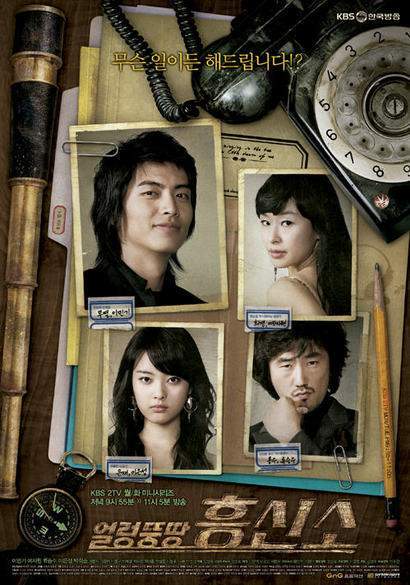 I still feel the soundtrack could do with toning down, as could the antics of Lee Min Ki and his friends. And I could also wish the editing were less slapdash, and the acting better (particularly by the female leads). But in any event, I trust Park Yeon Seon, so I’ll stick around to see how it all pans out.